First of all, I want to thank everyone for your support. From sponsors to Facebook friends and everyone in between your thoughts and positive comments have made a huge difference in my efforts to complete the final leg of the Save the Poles expedition. Safely back in base camp, and even a little rested, I wanted to better detail the events of the past few days, you know, - just so you know. Tshering and I had been pouring over daily weather reports for over a week. So far, Mark de Keyser from weatherforexpeditions.com had been unerringly accurate. Just a few days prior the Czechoslovakian team had been turned back from their attempt at Lhotse due to high winds (which Mark had predicted). The good weather window from the 12th to the 15th was too enticing to turn down, so the plan was made and we left base camp early on the 12th with the plan of summiting on the morning of the 15th. Heading up the ice fall, I tried not to think of all the unknowns. It was getting to the point that there were a few too many variables for me to feel comfortable. Still, I put my confidence in the team, my training and because I had no other choice, a little bit of luck. Getting to the South Col, I was surprised at how safe it seemed - big and relatively flat. Passang 'lama' and I arrived first and began setting up the tents. Gusts of wind knocked us around as we carefully staked out then set up one tent. When the rest of the team arrived, they set up the other, then we crawled inside and relaxed still in our down suits and boots. I wasn't totally exhausted but I was definitely tired. I didn't sleep at Camp 3 and knew I wasn't going to get any sleep between now and when we would leave for the summit. I started adding up the hours I had been awake, then thought better of it figuring ignorance, in this case, might help more than hinder. While climbing from Camp 3, I was continuously monitoring the weather. By the time we reached the Yellow Band, I had been watching clouds move in. Was this the bad weather on the 15th coming in a day early? It looked ominous and added to my stress. Cherring noticing my concern said, 'it's always this windy here.' This is good weather for our summit. Different than the Spring, our team would have to put in all the fixed ropes from Camp 4 to the summit. 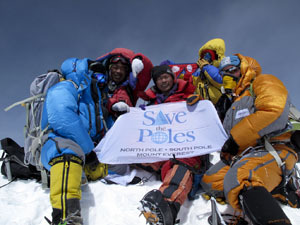 As the team's climbing leader, Chhering decided that he and Passang 'lama' would leave at 7 pm to begin the arduous process. Nima and Dawa would follow an hour later and Passang and I would start climbing around midnight. At 11:30 the radio crackled to life and I heard a string of muffled Nepali. 'Time to go,' Passang said. The pit in my stomach doubled in size. Although my gear was already packed I doubled checked everything and and attended to a few other odds and ends. I stowed some Clif Shot Bloks in my pants pocket so they wouldn't freeze, turned on the DeLorme GPS, drank as much water as my stomach could hold, tried to adjust all my Terramar base layers perfectly (it never happens)adjusted my Scarpa boots and put on my crampons - inside the tent to save my fingers from the cold. We climbed for several hours in the dark and cold. I liked not being able to see much. My Princeton Tec headlight cut a neat circle in front of me and it helped me concentrate on my one simple task: climbing Mt. Everest. The wind had died considerably and it was crystal clear. I have been in many remote places and seen amazing night skies, but never have I seen stars below me. It was an odd perspective - the vault of the night sky seemingly surrounding us. The big dipper, to my right, stood upright awkwardly balanced on its handle. Cassiopeia was now an inverted a now looked like an 'M' versus a 'W'. After four hours of steady climbing, we eventually reached the balcony - a small flat thumb of rock and snow.